This Holiday season we teamed up with Emsisoft to double protection of your device from various Internet threats. It’s simple. 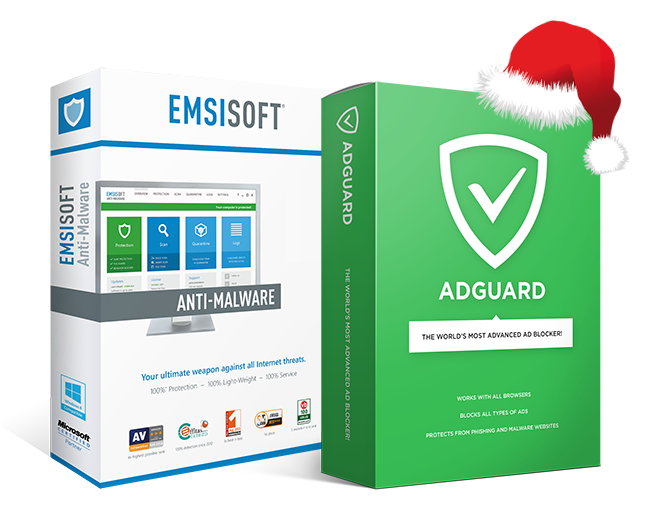 You purchase Premium or Standard Adguard license and get a free license key for****Emsisoft Anti-Malware for 1 year, 1 device. Emsisoft Anti-Malware is an antivirus and program against malicious software. It is a proactive weapon made to prevent infection from all Internet threats, protecting you from the worst case scenario by not even allowing it to occur. Promotion is valid for the purchase of new licenses only. Emsisoft key is not provided for extension/upgrade of your existing licenses. This promotion doesn’t apply to ‘Mobile’ licenses. The license shall be activated until March 2016, otherwise it will be blocked. If you decide to get a refund for Adguard license purchased while promotion, the free Emsisoft Anti-Malware key will be revoked as well. If you’ve already got activated Emsisoft, this free key won’t suit for extension of already existed license. It’s only meant for activation on new devices.